North Carolina based Death Metal band BLOODSOAKED concentrates on purely oldschool, no frills, straight forward, skull crushing Death Metal in the most raw and primitive form! There are no "slam till you can't slam no more breakdowns", no pig squeals, no arpeggios; simply classic Death Metal, nothing more, nothing less. 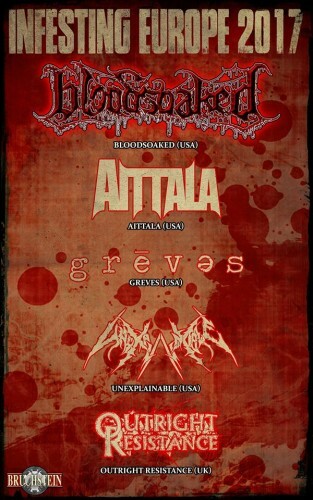 Aittala is an original metal band hailing from Raleigh, NC(USA). Why the name 'Aittala'? (pronounced 'eye-tah-la')Simple. A name was needed and Eric's last name seemed like a good choice. It's ambiguous and doesn't lend itself to any specific genre like some band names tend to do.The music crosses many metal genres; it’s hard to put it into just one category. 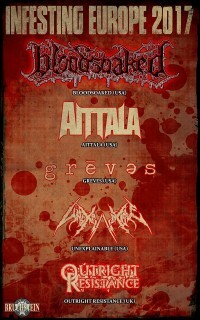 The sound infuses elements of classic heavy metal, doom, progressive, power, thrash and hard rock with lyrics drawing inspiration from the darker side of the human condition.The Aittala sound has been cited for being unique which isn't easy in this day and age.Aittala has released three full-length albums; 'Bed of Thorns' (2009), 'Haunt Your Flesh' (2011), and 'Effigy' (2014).In 2016, the band's fourth full-length album entitled American Nightmare was released. American Nightmare consisted of 10 brand new songs that returned to the more diverse song writing established on the first two full-length albums.Besides Eric, the current line up of Aittala consists of Gary 'Zeus' Smith on drums and Andrew Sullivan on bass.